Designer Emmanuel Aquin is ready to make the next step and take the already famous D-Day Dice from Print and Play to a commercial version. He has asked Valley Games to help him get it there and we were very happy that he did! For this version we are going to use Kickstarter to help get this project off the ground for Emmanuel. There will be many levels for people to get involved with this production and there will be lots of extra bonuses to make it a wonderful opportunity. 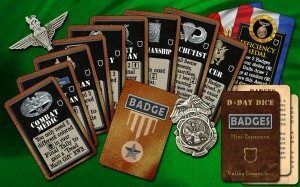 As promised here is a montage of the new Badges mini-expansion that we are going to give to everyone that has helped support the Kickstarter campaign. Thank you all for your support! 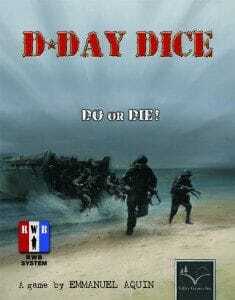 Listed below here you can see the rulebook for D-Day Dice as well as the component lists and descriptions for the game and ALL the expansions that are coming out at the same time. There are also descriptions in there for future releases as well so you know where things are going in the future! This is a sample of what the front cover could be for the new version.